When your looking for a performance memory solution, Patriot is one of the power house’s. They have a well known line of Ram Kits, solid state drives, and flash drives. But did you know they also have peripherals? BAM! your horizons are broadened. 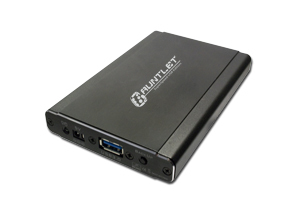 Today we are going to take a look at patriots USB 3.0 2.5″ Enclosure, Gauntlet. Simply on past experiences, I have High expectations for this device. Lets see if the gauntlet can hold up to what we have come to expect from patriot.